Structure built on top of a huge tomb used between 4,000BC and 2,300BC. An ancient tomb dubbed Cornwall’s answer to Stonehenge is to be rebuilt 5,000 years after it was first constructed by early man. Carwynnen Quoit (a term for a giant tomb) - known as ‘The Giant's Quoit’ - marked a macabre mass burial site used between 4,000BC and 2,300BC. 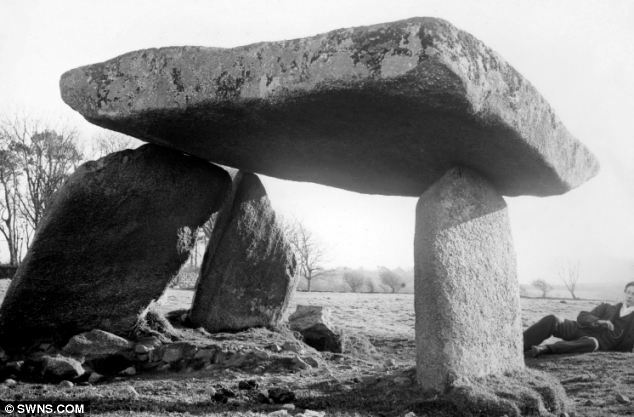 The 'Giant's Quoit' before it collapsed in the 1960's. An ancient tomb dubbed Cornwall's answer to Stonehenge it is to be rebuilt. The stone structure, set in five acres of farmland, was originally built on top of a huge tomb thought to contain the remains of Neolithic men. It was later used by the Victorians for picnics and was a meeting place for members of the traditional Celtic religion. But the Stonehenge-like structure collapsed in 1834 and was rebuilt but then fell again in 1967 following an earth tremor. Officials at The Sustainable Trust and English Heritage are now planning to rebuild the structure which lies in Troon, Cornwall. Pip Richards, trust director, said they have begun a dig at the site and want to turn it into a tourist attraction like Stonehenge. She said: 'It’s such a waste for these stones to just lie on the floor. 'English Heritage will need to be satisfied that the monument will stand for 100 years before permission to proceed is granted, but we are confident. The capstone is 3.3m long, 2.5m wide and 0.3m thick and would originally have had a covering of earth. Carwynnen is one of around 12 megalithic tombs, or quoits, that survive in Cornwall. It is believed quoits were built as tombs for complete bodies and when the one at West Lanyon collapsed two centuries ago excavation revealed a number of skeletons. Some archaeologists believe the structures were left partially open and bones were removed and returned. A 'wizard' for the 21st century has conjured up a 'Solar Eye' device which uses fixed crystal balls to accurately plot the Equinox. 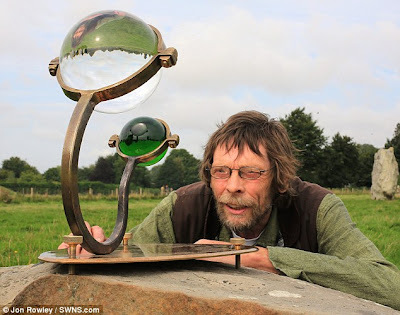 Blacksmith Pete Smith, from Hereford, took two years of trial and error to perfect his 'solar sun dial' which optically traces the relationship between the sun and earth. The hand-crafted Solar Eye not only predicts the precise timing of the equinox, but shows how the sun's zenith, or highest point, changes throughout the year. The model is so accurate that - when he sells miniature models - he tweaks them depending on the buyer's postcode, as the Equinox is slightly different in, for instance, Cornwall than it is in the Orkney Islands. The model - two spheres of optical quality glass mounted on a brass cradle - also reveals when the Full Moon is at its zenith and can also be used as simple sun dial. Pete, one of the country's top blacksmiths, lectures at the renowned National School of Blacksmithing at Holme Lacy near Hereford. He said: 'The Solar Eye uses two optically corrected glass balls, one clear, one coloured, which are aligned so that the point of coloured light thrown by the smaller sphere tracks in the same lateral direction as the sun. 'At the same time the clear optical ball throws a larger shadow which tracks on the ground in the opposite way so at the equinox the shadow is eclipsed by the coloured light. 'I was born on the autumn equinox in 1952 so I suppose that's where my life-long fascination with astronomy must have started. 'About two years ago I had the notion that I could chart the passage of earth and the sun by mounting two spheres of optical quality glass. 'It led to a lot of trial and error as I forged the metal mounts to hold the glass spheres and I had a lot of broken glass in my forge as the metal shrank to tight and cracked them. The optical specifications of the Solar Eye are so intricate that Pete sets up individual devices for different latitudes on the globe by using post codes or Google. Pete, from Presteigne, Powys, added: 'I can set them up for different latitudes by post code, so one for Cornwall would be a slightly different shape to one set for Orkney. 'People say they find them pleasing to the eye which, as craftsman, is very much part of what I want to achieve and I strive to make things that are simple but beautiful. Pete is one of only eleven 'Licentiates' honoured by the Worshipful Company of Blacksmiths and his more conventional masterpieces include the entrance gates for Hereford Cathedral. He has completed projects and restoration work for most of the national heritage organisations including English Heritage, the National Trust and Heritage Scotland. His installation art pieces include a 40-foot long metal Loch Ness Monster and a metal and cheese cloth replica of Stonehenge on a by-pass roundabout. It’s 18 years since a Wonderbra advertisement was blamed for dozens of road accidents. Now, it’s Stonehenge and the Angel of the North distracting drivers. 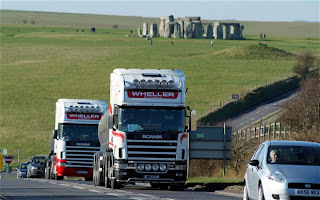 A quarter report that the standing stones on Salisbury Plain have caught their attention when they should be keeping their eyes on the road ahead, and of those drivers, one in eight has crashed or come close to it. What, then, is to be done about it? 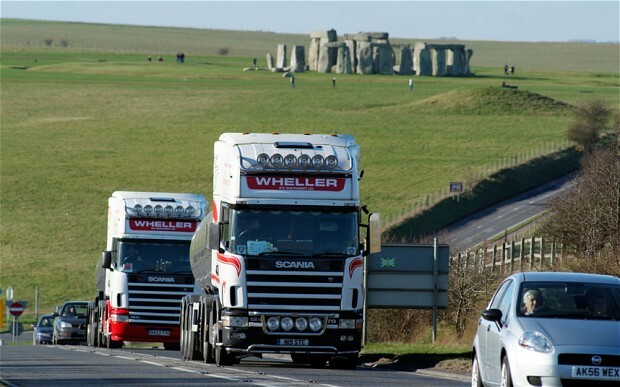 Should Stonehenge be moved further from the road? Or the Angel of the North hidden behind a hessian screen? Perhaps perspective is needed here. We suspect that inside jobs remain far more distracting than public monuments – a wasp on the loose, what the children are up to in the back, a lost mint, tuning the radio, even the satnav display. 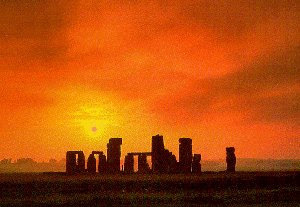 Anyone with the willpower to stop a moment to rummage in the glove compartment should have no trouble dealing with Stonehenge. The most beautiful and memorable Handfasting and Marriage Ceremony is assured. HandfastingThis is when the couple base the entire ceremony on and around the handfasting. Usually held outdoors, maybe in a forest or woodland area. Stonehenge* is a special location for handfastings. The inner circle has been closed to public access since 1978. 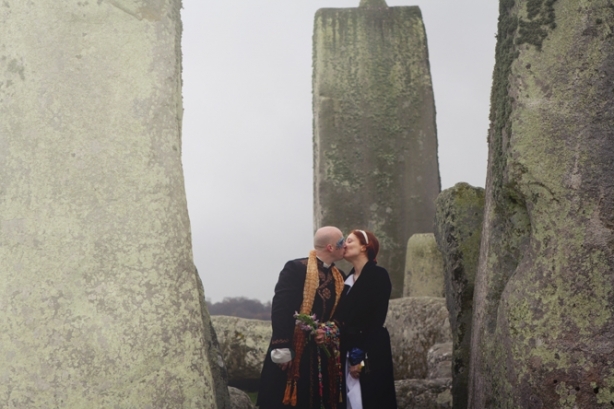 However, we are able to obtain permission to have a wedding ceremony and/or handfasting within the inner circle of stones. This can be arranged at dawn or dusk. A Full handfasting will include 'Calling on the Elements within a Ceremonial Circle'. Handfasting, following the Celtic tradition, is a betrothal or wedding ritual in which the couple's clasped hands are draped with a cord or ribbon while the couple holds hands. The ‘tying the knot’ is sometimes referred to as 'Bonds of Matrimony'. This is an ancient, Celtic, nature-related, spiritual tradition that took place long before weddings became a legal function of the UK government. It is an old ceremony of commitment, first recorded 4,000 years' ago! This Celtic ceremony of unity represents the intention of two people to make their lives together and ideally to love and cherish one another. Their hands, or more accurately, their wrists, were literally tied together. Each partner holds the hands of the other - right hand to right hand, left hand to left - their wrists crossed. The ribbon is wound around the wrists over the top of one and under and around the other, thus creating the infinity symbol. a betrothal of a year and a day, which the participants can then decide whether to renew or not at the end of that period. Sometimes a couple prefer a Traditional Wedding Ceremony and include a handfasting as part of their ceremony - immediately after saying their vows. According to Celtic Spirituality, God is found in all things, not only the human heart, but also in all of God's creations. The elements of Earth, Fire, Air and Water are called upon to cast blessings upon the couple. The ritual is designed to enable us to get in touch with the life force within ourselves, to sense an interconnectedness with all life, and to access the energies of the living earth. Handfastings are conducted in a circle, which is a symbol of eternity - sign that life, love and happiness have no beginning and no end. All who enter the circle must do so in perfect love and keep sacred the ceremonial space. "The most beautiful and memorable Handfasting and Marriage Ceremony is assured"
*STONEHENGE: Since 1978 visitors are no longer permitted access within the circle of stones. It is highly probable we can arrange your ceremony WITHIN the Circle of Stones at sunrise or sunset. Just how special will that be? Wedding, Renewal of Vows or a Handfasting? N.B If you have the slightest interest in arranging our Celebrant perform your ceremony, you are encouraged to check availability. 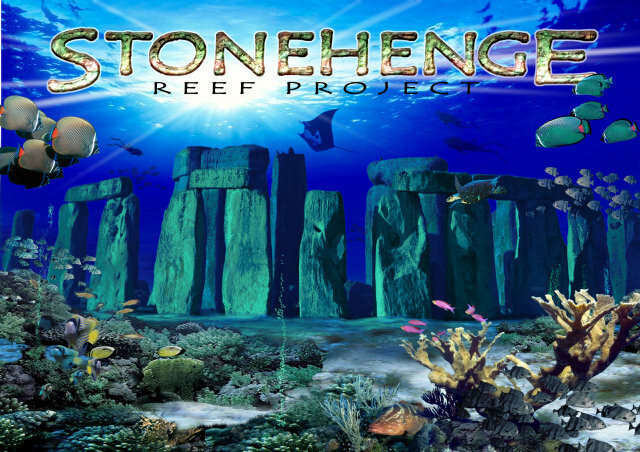 A South Florida entrepreneur is working on an artificial reef that will be a smaller-scale replica of England’s Stonehenge and placed 3 miles off Key Biscayne. A Miami-Dade County’s collection of artificial reefs includes sunken ships, Army tanks, pieces of a passenger jet, radio towers and a cemetery modeled after the mythical Lost City of Atlantis. In the next year or so, Stonehenge may be added. A scale replica of England’s mystical stone monument is slated to be deployed in waters 40 to 60 feet deep about three miles off Key Biscayne in a special management zone that already harbors several other artificial reefs. Built of carved limestone from a Homestead quarry and reinforced with fiberglass composite rods, the concentric stone circles are expected to be a haven for marine creatures and scuba divers. Levine says Stonehenge, taking up about a half-acre of the ocean floor, will be larger than the neighboring Neptune Reef, the Atlantis-like graveyard Levine created in 2007 that was taken over by the Neptune Society, a cremation services company. Levine says Stonehenge will have more than 15,000 cubic feet of stone weighing 1.2 million pounds. The tallest of the stone structures will rise 24 feet from the bottom, he said. “We’re going to build it in its completed form — not in its current form where half of it is missing,” he said. 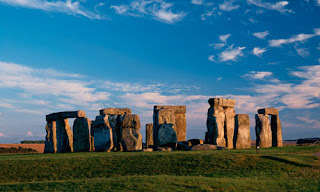 Levine and his Reefbuilders colleagues have recently begun carving limestone blocks into Stonehenge configurations. They plan to transport the structures in 200-ton barge loads out to the deployment site, with the first phase placed in early spring 2013. Levine said the columns will be oriented just like the real things standing in the English countryside — lining up with the summer and winter solstices. 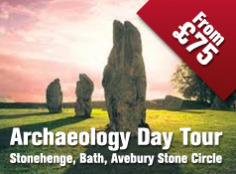 The original Stonehenge was constructed by unknown architects beginning about 5,000 years ago and believed to be a burial ground and celestial observatory. The new artificial reef has the tentative blessing of Miami-Dade’s Department of Regulatory and Economic Resources/Environmental Resources Management section, according to Steve Blair, chief of the restoration and enhancement section. “As far as we’re looking at it, the materials are appropriate. It can be enhanced to increase habitat benefits from it,” Blair said. Blair said he would like to see smaller enclosed spaces added to the collection of stone columns to create hiding places for smaller creatures such as lobsters and reef fish. Once that issue is resolved and a specific site selected, the county will look at final approval. Meanwhile, Levine — an entrepreneur with ventures including selling aircraft, running a weight-loss clinic and raising live rock for aquariums — is looking for help to fund the project, which he estimates will cost $400,000 to $500,000. 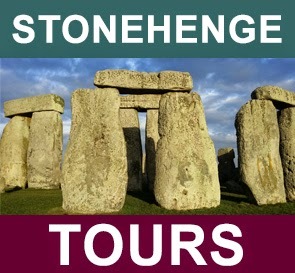 He said he’ll offer 65 “naming opportunities” for individuals or groups who support Stonehenge. “We want to talk to people who use the ocean and love the ocean to support the project,” Levine said. The last major artificial reef deployed in Miami-Dade coastal waters was the 210-foot freighter Ophelia Brian in December 2009. Could Stonehenge feature in Hollywood blockbuster ? Could Stonehenge be about to feature in a Hollywood Blockbuster? Film crews have been at the famous site and it's thought they're working on Thor: The Dark World. 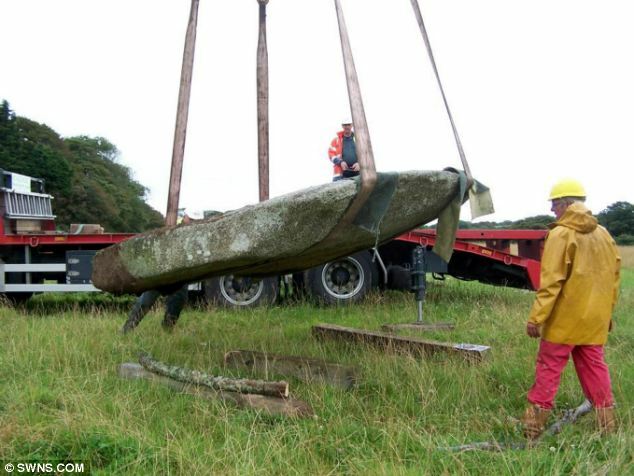 English Heritage have confirmed cameras have been at the historic monument in the early hours of August 29th although aren't able to reveal which production company is involved. The sequel to the 2011 film Thor is directed by Kenneth Branagh and stars Australian heartthrob Chris Hemsworth, Oscar winning actress Natalie Portman as well as Anthony Hopkins and Christopher Ecclestone. It is due to be released in Autumn 2013.